The following article has been contributed by a fellow prepper named Kevin. It has been published with permission of the author. 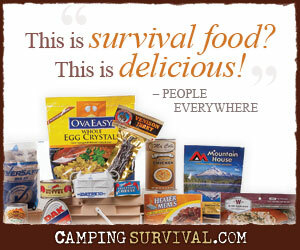 It does not necessarily represent the views of PreppingToSurvive.com. Water bottles. Carrying a bottle of water in work or school is an everyday reality for most people, but few people have the foresight to keep a bottle in the car, even though it seems like the most obvious thing in an emergency. Dehydration can lead to tiredness and fatigue behind the wheel, but it’s not just you that needs to keep hydrated when on the road, your car can also overheat and need some H2O. A flashlight. An accident is more likely to happen at night, and whether your car is involved or you come upon an accident in your path, a flashlight is essential in order for you to take charge of the situation and prevent further damage by flagging down other cars or helping those that are wounded. Being seen at night is essential when on the road, accidents are far more likely to occur near other accidents unless the proper precautions are taken. Insurance/breakdown information. Car insurance is obviously a basic necessity in any emergency on the road, but what people often neglect is to always carry a card from their insurance company with all the relevant details on it, in case you get into a fender bender and get flustered on the motorway with thousands of cars whizzing by. The last thing you need is someone suing you or ending up in a bind with the insurance company because the proper precautions aren’t take. While we’re on the topic of accidents and emergencies on the road, breakdown cover is one of the most important things to have if you’re serious about being prepared for the worst and as the old saying about guns goes it’s better to have it and not need it, than need it and not have it. First aid kit. A first aid kit is mandatory in most European countries, but just because it might not be obligatory where you live, it’s always important to be prepared for the worst. there are plenty of good first aid kits available online or from your local camping store, but you can put one together yourself for as little as $20. Laura & I keep quite a few additional items in our vehicles. Laura blogged about some of those earlier. Tarp, blanket, Bug Out Bag containing: multi-tool, 2 kinds of fire starter, change of clothes, walking shoes, roll of paper towels, water filter bottle. Jerky. Walking shoes are a great item that is commonly overlooked. You definitely don’t want to hike 5 miles in uncomfortable dress shoes. A fold-up bicycle? That I’d like to see. Do you have a link? think of the 10 C’s… plus a first aid kit. All of the above can be stowed in a tidy container or bag. I also try to keep some essentials within arms reach in the event you are pinned in the cabin or suffer an injury that impairs your mobility. Small ditty bags can be filled with some basics like a penlight, pocket knife, protein bars, whistle, etc. and could put it in a console, glove box or door panel. My keychain has a houdini tool which has a built in webbing cutter, glass break, and whistle… the light on it isn’t very robust, but I keep a few other items on my keychain and can grab them one-handed if need be. Good point. We have a couple of levels of items in our car – the first is designed to make a trip more comfortable. It has snacks, water, etc. A long trip with hungry young ones can be tiresome for everyone. The second set of supplies are for times of trouble. It contains the flashlights, the emergency rations, the medical supplies, the shelter making materials, the tire repair kits and travel air pump, etc. Those are designed for what we’d consider major emergencies. Thanks for the comment Dustin. Personally I wouldn’t store MRE’s they have a very short shelf life when exposed to heat and need to be rotated on a regular basis. The mainstay rations while they don’t taste as good will last 5 years in the back of your car. Couldn’t agree more, Howard. It’s critical to rotate your car supplies frequently if you live in a place where the inside temps of a car can exceed 120F in the summer months. Check out this vehicle first aid kit: http://www.happypreppers.com/First-aid.html It’s also good to have Quik Clot Sport handy for car accidents. Happy Prepping! One of the handiest devices to keep in your car is a 12 volt tire inflator. Unless you have a total blowout, this will allow you to keep your car moving until you get to a place of safety. Absolutely. Laura bought one of those for each vehicle along with a tire repair kit. Great feeling to know that we have those in the back. I posted an article on how to plug a tire a while back for those interested. In addition to my EDC, my vehicle emergecny kit has fix a flat supplies, flahslights, fire extinguisher, jumb starter, extra 5-30w oil, 5 gallons of gas, ATF, power steering fluid, washer fluid, de-icing salt, ice scrapper, work gloves, road flares, tow strap, and a seat organizer with 12 hour supplies and person items….etc. I also take along my 72 hr kit and first out bag. Good additions, Toby. I particularly like the extra fluids. Military duct tape , its tough as nails , comes on OD or coyote brown and is 100 times better than you can pick up at any store . Army 2 quart canteen , flat pry bar . I keep a lot of that in a couple of totes under the back seat of my extended cab. It’s come in handy at times. The only thing that I need to remember is to carry a backpack with me to carry the stuff should I have to abandon the truck. I don’t want to hand carry a couple of totes.